Roger Revelle, at Scripps Instittue of Oceanography (SIO), hired Keeling in 1957-58 to conduct a baseline survey of carbon dioxide accumulation in the atmosphere. 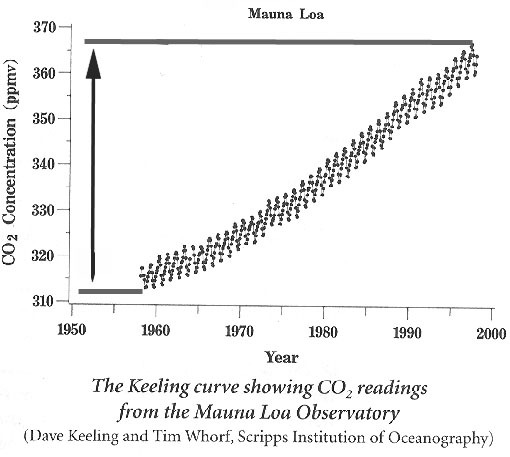 "Keelings inexorably rising carbon dioxide curve was widely cited by scientific review panels and science journalists." "Keelings data put the capstone on the structure...no longer could a well-informed scientist dismiss...the possibility that our emission of greenhouse gases would warm the Earth." Spencer Weart, The Discovery of Global Warming, p. 38. "Putting the various strands of temperature research together, the picture that emerges is profoundly ominous. It begins with bare physical measurements --independent of computer models. Carbon dioxide in the atmosphere traps heat. For the last 10,000 years, the amount of CO2 remained constant at about 280 parts per million--until the late nineteenth century, when the world began to industriallze using coal and oil. Today that 280 is up to 379 parts per million. That is a level the planet has not experienced for 420,000 years." Ross Gelbspan, Boiling Point, p. 31. Hardin, Filters Against Folly. pp. 190 -191. "As Broecker for one recalled, it was the 1967 paper 'that convinced me that this was a thing to worry about'." Recent Results Clear Up Key Uncertainties.  Humans have been releasing unprecedented levels of greenhouse gases (GHGs) from fossil fuel use and deforestation.  As a direct result, concentrations of greenhouse gases in the atmosphere are at their highest levels in the last 400,000 years. Carbon dioxide concentrations are over 360 parts per million (ppm), 30% above pre-industrial levels of 270 to 280 ppm.  Surface air temperature increases of 0.7 to 1.4 degrees Fahrenheit over the last 100 years are undoubtedly real. This finding addresses questions raised by a lower temperature increase from satellite measurements; the remaining discrepancy is likely a statistical sampling issue arising from the short length of the satellite record. (National Research Council/National Academy of Sciences, January 2000).  The rate of increase in temperatures is increasing in the 1990s. 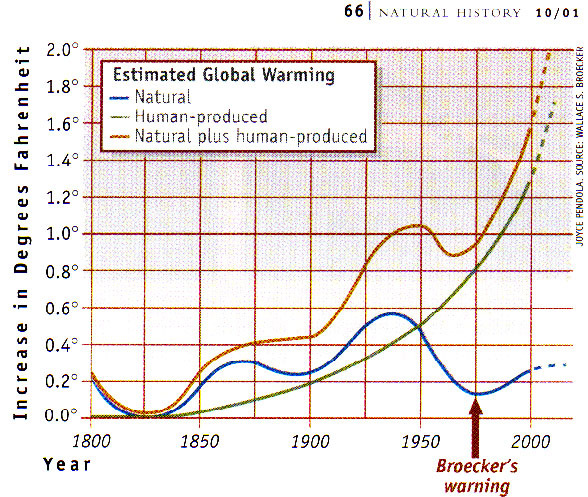  Warming of 3.4 to 5.2 degrees Fahrenheit is projected from 1990 to 2100 under business as usual scenarios. Hot spot: A report by the National Climate Data Center says the rate of warming on Earth is accelerating. Scientists who first sounded the global-warming alert predicted temperatures on Earth would accelerate at a rate of four degrees Fahrenheit in the next 100 years. Now comes data from the National Climate Data Center that indicates the globe has already warmed at that rate in the past 25 years. "This could be the start of a greater rate of warming than we've seen," said NCDC director Thomas Karl. Karl and his colleagues analyzed recent global temperature data, focusing on 1997 and 1998, when record high mean temperatures were recorded for 16 consecutive months. The temperature gains were unprecedented, said Karl. "What's important is the fact that the 1997-1998 events that were so warm globally were warmer than what we would have anticipated with the constant rate of temperature change since the mid 1970s," he said. "We're trying to raise awareness of the fact that we now have events taking place that are not consistent with what we've seen in the past." There is a 5 percent chance that the string of record high temperatures in 1997 and 1998 was an unusual event rather than a turning point, Karl maintains. The data shows that 1999 was the fifth warmest year on record, despite the cooling influence of La Nina. Outside the band between 20 degrees north latitude and 20 degrees south latitude, 1999 was the second warmest year in the 20th century, just behind 1998, an El Niño year. A record of temperature range during the past century. Degrees in Celsius are indicated on the right side of the graph. Degrees in Fahrenheit are noted on the left.Karl and colleagues aren't ready to declare that the rate of global warming has suddenly increased. However, their data strongly suggests that the increased warming since 1976 is the result of human activity, Karl said. The scientists recommend more studies to anticipate the potential effects of climate change. The researchers analyzed data from satellite and land-based instruments and concluded that the rate of global warming since 1976 is greater than the average rate during the late 19th century and ensuing 20th century. In a report released in 1995, the Intergovernmental Panel on Climate Change projected that the rate of global warming in the 21st century would be between two and six degrees Fahrenheit. From his research, Karl concludes that global warming since 1976 is occurring at a rate of four and five degrees Fahrenheit per century. Karl's research will be published in the March 1 issue of Geophysical Research Letters. Related Sites The National Climatic Data Center is the world's largest active archive of weather data.